Lyndon, the county seat of Osage County, is a beautiful town with good schools, several churches, a swimming pool, plus over 100 businesses in the immediate area. Located midway between two federal reservoirs, Lyndon has easy access to year round outdoor recreation. Festivities throughout the year make Lyndon the place you want to be. The Lyndon Chamber of Commerce/Pride Fall Festival features crafts, activities for children, baby contest and talent show. Each year it gets better. The beginning of Christmas is celebrated with a big Christmas Parade on the second Saturday of December. More and more young people are choosing to make Lyndon their home. 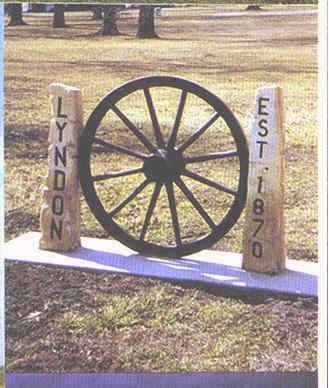 But an untapped source to attract visitors Lyndon is its history. Lyndon was established March 14, 1870, when four townsite owners contributed 40 acres each to the establishment of a town. Two of the contributors, Haas and Gilliland have descendants who still live in the community. Earlier in 1842, the US government signed a treaty with the Sac & Fox of Mississippi residing in Iowa. The tribe agreed to give up their Iowa land for land in Kansas, part of it being the site where Lyndon now stands, almost in the center of the reservation. After Kansas became a state the Sac & Fox were soon removed to Oklahoma, and the land was immediately put up for sale by the government. One hundred and thirty years ago in 1870, Wells P. Bailey built this two-story log house of native walnut trees. The logs were hand hewn with some as much as 20 inches in diameter. The Lyndon Carnegie Library is believed to be one of the smallest Carnegie Libraries in the United States. Erected in 1910 from a grant of $7,500 from philanthropist, Andrew Carnegie, with the provision that the township agreed to maintain it at a cost of not less than $750 per annum. The Lyndon Museum and Research Center offers an interesting collection of artifacts and records that give insights into the early days of the county and its citizens. Lyndon's first school was located in the home on Madison Street shortly after Lyndon was founded in 1870. The house continued as a school until it was purchased by School District 28 in August, 1889 for $300. The school continued to own the property until October, 1907.